Oh My Swear Word...And I Mean Bad Ones! Okay, let me just warn you, this is a complainer entry so settle in for some venting. I really have tried to accept my new culture as different; not good or bad, but it has to be said, the United States really does do some things better! It is very common for rented houses/apartments in Germany to not have a furnished kitchen. They offer an empty room with outlets and wires, but you must supply the counters, cabinets, appliances and anything else that makes a functioning kitchen. I started working on my kitchen three weeks ago at Ikea as they are the "cost leader" in cheap kitchens. 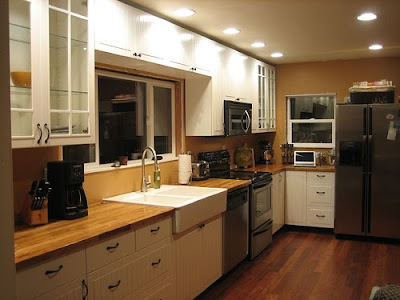 Well, partly what makes them cheap is you, the customer, design your kitchen with their super handy kitchen program. So, I show up to Ikea three weeks ago...I've wandered the store, I know what I like, I've measured my kitchen and I am ready for step two, the design studio. I find someone who speaks English explain my situation and say, "can I just pay someone at Ikea to design this for me?" I am told, "No, it is not possible, you must make it yourself." "Okay, but the website is in German and I don't speak German." So, he hands me an old brochure where I can draw my kitchen. I spend the next 2.5 hours wandering around choosing door knobs, a sink, an oven, a hood, etc. I am almost in tears when I call Bob to complain. Just as I am cursing this new country I turn around and there is my Ikea helper. I quickly hang up with Bob and he says to me, "I see you are in despair, I have 30 minutes, I will help you." Finally, some customer service! I am grateful, but again I want to cry because I am so needy. So I work with him and then another associate for 1.5 hours. We get the basics down then realize the price is to high, so I'm going to have to make changes, but another day because it is now 3:30pm and I have to pick up my girls. Fast forward, two more trips to Ikea making changes trying to cheapen my kitchen. On my last visit we finalize the design and I am given a printed list of my goods with a schematic. I am going to take it to Bob for final approval then I will return to pay. Today, as I directed on my last visit, I went to customer service to pay. I whip out my 20 pages of kitchen stuff and the gentleman tells me I do not have a service order. I need to go back to Kuchen (kitchen in German; see I have learned something these last few weeks) and get a work order. So, back upstairs I go. I make a quick sweep of the section for my English speaking friends... I don't recognize anyone and all the agents are busy. As I only need something printed out I go to the "express kitchen help" desk. Express is sort of tongue and check--I waited 20 minutes while two associates helped one man. When it is my turn I explain what I need and they say "okay, we can help you right over here." Hooray1, this isn't going to take too long. One hour later, I am told not all the pieces for my kitchen are in stock and I can wait 2-3 weeks for the missing pieces to come in or go to another store. HELL NO, I am not going to another store--and I am not waiting 2-3 weeks. I specifically chose the pieces I did because they are "always" in stock and they can be installed within 3-5 days. The missing pieces are glass doors to the cabinets. I agree to have the kitchen installed minus the doors which can be put on by Bob at a later date. I am then handed a new 20 page document and head back down to customer service. One person in front of me, this will be quick, right? Nope, 30 minutes later, my turn. I hand over the documents, and pull out my bank card a little prematurely because he takes 45 minutes to look over my documents, ask me questions, discuss installation etc. Oh, and by the way, they can't install until next Friday 10 days from now because this is a BIG kitchen..."you American's like big kitchens" he says with a smile on his face. "Ok, fine, next Friday and yes, you can deliver the parts on Thursday because this is such a big job.... Okay, here is my bank card." The cost of the kitchen is 5100e. He swipes my card and it is rejected. He assures me this is not a problem, it is a big amount and maybe the bank doesn't like big amounts. He tries it for 2500, it goes through. Next 2500 again, no go. 1000, no go, 500, yes, 500 again, NO. So, I've paid 3000e of my 5100e kitchen. He asks if I have another card. I'm like, "uh yes, I have lots of American cards, but I suppose you won't take any of those." I ask if Bob can go over to the store next to his work in Augsburg and pay the remainder, “no that's not possible.” He suggests I open an Ikea credit card. "Okay, but I don't have a job here." "No, problem," he says, "All you need is your passport and residence paperwork. Do you have that with you?" Are you kidding me? "NO!" The only option left is to call the bank which ironically, I can not do. Somehow, I turned off my phone and when I restarted it it asked for a pin number which NATURALLY, I don't know, so the phone is locked and I can't call Bob or the bank. I leave the store three hours and 5 minutes after arriving with NO kitchen. I drove back to the school to get Eliza's phone and called Bob who called the bank. Five minutes later he calls to tell me the bank will not raise my limit above 5000 and if I use all 5000 at Ikea, I cannot use my card for the rest of the week. "WHAT?" It is MY money and I can't spend it? Fine, I will take off a 200e item and charge the rest. Back at Ikea I explain my 5000e limit and ask, "can I take this 200e item off." No, is the short answer because if we do that we will have to create a new work order and I know what that means...more lines and more time! I have 100e in my wallet, so we decide to charge 5000 and I will pay 100 in cash. I hand over my card and guess what, IT DOESN'T WORK. IT WILL NOT LET ME CHARGE BEYOND 3500E. F words are about to start vomiting out of my mouth, I am so beyond myself. I have to say, my customer service guy was very nice and very sympathetic to my plight. He pointed me in the direction of the ATM and told me to give that a try. It took three transactions, but between my US and Deutsch banks I was able to get enough cash out. At last success! But wait, I am not finished yet. Since I am ordering my kitchen with Ikea, I get my measurement money back. They don't apply it to the kitchen cost, it is a cash return... at another customer service line. So, I am standing in a new line. The women takes my paperwork and hands me a hand written slip and says, "okay you get your money back at check out.” You've got to be kidding me, ANOTHER line? The Munich Ikea is like shopping at Wal-Mart on Christmas Eve, it is always busy and today is no exception. There are at least ten lanes open and each one has ten customers in line. More swear words, but I've got 70e coming back to me and since I can't use my debit card for the rest of the week, I need the cash, so I wait. Amazingly enough, I made it out of there and back to school to pick up the girls with five minutes to spare. PS...On the way back home the song, "Highway to Hell" came on the radio. I don't know if that was some cosmic coincidence or if God was trying to tell me something, but it certainly was apropos for how I was feeling!